Mrs. Nguyen Thi Phuong is 27 years old. She is living with her husband and two small children in Phuc Yen town, Vinh Phuc province. In 1996, she joined TYM Fund and borrowed money to invest in raising livestock and growing forest. Currently, she is raising pigs and chickens at home, and Mr Thang - her husband - is a casual worker. 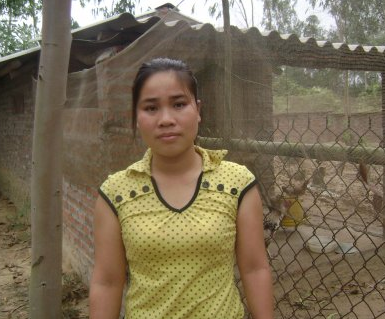 With an income of VND6,000,000 per month, the living condition of Mrs Phuong's family is increasingly improved. In this loan cycle, she wishes to borrow to buy more chickens and foods for poultry.